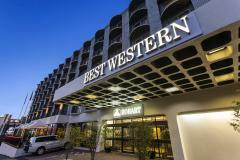 The Mercure Hobart is located in the CBD, only two blocks from the main shopping mall. The hotel features local artwork in a contemporary setting, while the 140 rooms have a modern fresh feel and offer either city or mountain views. It is only a short walk to Salamanca Place on Hobart's historic waterfront, an area well known for the many restaurants, cafes, bars and the famous Saturday market.